Charging the Earth - Solar! : Time delay for inventions to public acceptability. Time delay for inventions to public acceptability. http://chargingtheearth.blogspot.com/2010/04/platinum-analogy.html which discusses why there may be a 30-40 year time lag between an invention and its acceptance. Blackthorn: "Good article! Explaining details about catalytic converters." as the victim, should it go wrong. What was the reason for the delay? Well, in the early days they were steam powered, and seen as suitable only for 2 or three storeys, for example in the first Department Stores. 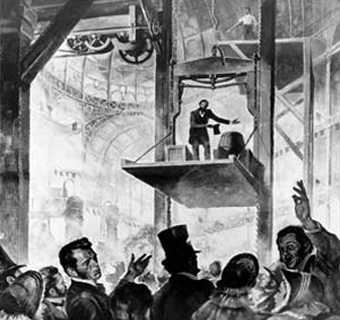 After a long battle between Edison and Westinghouse, AC Electricity didn't come as a usable system in buildings until 1881 after which it was possible to consider using an elevator up to or beyond ten storeys. So the 'systems context' in which an invention exists has to be right too. Until Ground source heat pumps with boreholes are more commonly installed, there is less demand for solar charging of the ground. Of course, there is a chicken-and-egg conundrum because if more people know about solar earth charging they are more likely to opt for a vertical borehole with a ground source heat pump. Only today, I had an enquiry from PV installation company who are moving into heat pumps who want to do their own GSHP installation in a building they are refurbishing. The very existence of solar charging (as a possibility) encourages them to think of using a GSHP with vertical borehole. I am aware of the logistics of plumbing and control and metering for the solar charging, so this looks like an interesting project for the future. Brings me back to the idea of Value Engineering - how much would I charge to instal one of these systems? Materials, labour, time. Armaflex LTD Self-Seal is a closed cell, with rubber thermal pipe insulation. Self-Sealing products are at a price premium compared to normal unsplit tube, but can be worth it if your time is limited. I was greatly impressed on the post you have written. This is really a good site with great information along with excellent post about Sell Catalytic Convertors for all to view on this site.